Two ideas from a reader. OR buy straddles or strangles during earning season, and only buy highly volatile stocks…same as above.. Close out the winning side and let the other expire worthless.. Better chance using these strategies to make $ than many other strategies . I agree that vertical credit spreads represent an excellent opportunity to make money with limited risk — as long as position size is appropriate. However, reality is not quite as simple as you describe it. For one thing, it is difficult for the inexperienced trader to earn income as a straddle buyer. Weeklys options tend to be low priced, and that makes the available premium small. If you use stocks or ETFs that “barely move” then the option premium will reflect the non-volatility of these stocks. Translation: very small premium with very little profit potential. We each have out own idea of how much credit to accept for a 5- or 10-point spread, but I do not like the idea of accepting only $0.05 or $0.10, even though the odds of having a winning trade are high. “Close out the winning side” and allow the other to expire worthless is not viable, in my opinion. When selling credit spreads, the usual practice is to sell OTM options — with the hope that all options will expire worthless. Thus, there is seldom a “winning side.” And when there is, the other side will not be too far out of the money and carrying it naked short is far too risky. Selling one side leaves the trader with a naked short position. Although a reasonable strategy for the experienced trader, I strongly discourage newer traders from owning naked short positions. When the option is a call, most brokers will not allow their customers to own such positions because (in theory) the potential loss is unlimited. I like the idea of no-brainer strategies as much as anyone, but in the trading world, these strategies rarely occur and most fall under the umbrella of “arbitrage.” For me, this plan has a small possibility of causing a giant loss (after selling your long option), and that takes it out of the no-brainer category. When trading Weeklys, instead of adopting your suggested approach, I’d prefer selling the options naked in the first place, rather than buy the spread and then sell the long option 2-3 days later. I’m not recommending this plan, but if position size is small, it should work better – especially when the premium for a spread is so little. Buying straddles in earnings season is a high-risk play. It can work, and one advisor whom I know has done very nicely with this strategy. But it is mandatory to do your homework. The timing of the purchase (never at the close of trading when earnings will be announced prior to the next day’s opening) matters. Some stocks lend themselves to the straddle play better than others. Again do your homework. It is very acceptable to sell the winning side, but in my opinion, that sale should be made sometime near the opening of trading. NEVER enter a market order; and especially not at the opening. Always use limit orders. You bought an option at high volatility and you cannot afford to hold and allow residual time value to decay. Do not turn this into an investment. Yes, you can allow the non-winning portion of the strangle to expire worthless, but I believe that it is far better to sell it at the same time that you sell the winning portion of the trade. Of course, I would not sell for as little as $0.05 or $0.10 (because miracles do happen), but $0.50 is real money when trading straddles and you cannot simply allow that cash to get away. One more point: When the earnings news is right on target, your straddle will lose a lot of value. Accept that and dump the position before IV collapses even more than it did at the opening of trading. Most traders believe that “expiration Friday” is the true day that option contracts expire. That has never been true. Expiration occurs on the Saturday that follows the 3rd Friday. However, next year expiration officially moves to Fridays. You may ask: How is this important to you, the options trader? Answer: It is of no importance. But you may want to learn the rationale behind the move. Here is the official definition of “expiration date” according to the CBOE. Expiration day for equity and index options is the Saturday immediately following the third Friday of the expiration month until February 15, 2015. On and after February 15, 2015, the expiration date will be the third Friday of the expiration month. To understand why expiration was originally set to Saturdays, read my explanation here. –If you wait too long and have already lost too much money by the time that you decide to adjust the position, then all the adjustment can do is help you not lose too much additional money. It is unlikely to produce a happy overall outcome. I understand that we don’t like the idea of adjusting too early because the market may reverse direction. However, there is a good compromise that depends on your comfort zone. I hope that you can discover that compromise. Consider adjusting in stages. –If it is the adjustment trade itself that produces the poor results, then there are alternate adjustment strategies. Rolling is not the only choice. And if you do roll, I urge you not to increase position size by more than a modest amount. It is okay to roll from 10 spreads to 12, but increasing size to 20-lots is just asking for trouble because some trades get rolled multiple times and positions can become var too large. –It is easy to get burned when you sell extra put spreads (on a market rally) or sell extra call spreads (on a decline). It the scheme of things, it is very important to prevent risk from escalating. Translation: If you must sell new put spreads on a rally, please cover the already existing put spreads — just in case we see a market just like the past week. The rising market reversed direction suddenly and made a bit move lower. There is not enough residual profit potential in that original put spread to risk leaving it uncovered. That is the reason it pays to cover when selling a newer spread. –If you are trading with a market-neutral bias, then the adjustment should return your position nearer to delta neutral than it was before the adjustment. In other words, when you do not have a market bias, try to avoid using the adjustment to recover lost money. Don’t suddenly decide to trade an iron condor that tries to take advantage of the current market trend. In general, iron condors are not suitable for traders with a market bias (unless it is a small bias). –If none of those situations apply, if you provide an example or two that describes what went wrong, I will try to provide some insight on your trade. Remember that every losing trade does not mean that the trader made any mistakes. When trading, risk management is an essential skill. There are many ways to control risk and it is difficult (if not impossible) to compile a complete list. However, at the top of the list is one easy-to-understand concept: Position size. That means that traders should always be aware of what can go wrong with every position and be certain that your account can survive the worst-case scenario. One very popular strategy for handling a position gone awry is the “roll”. Rolling occurs when a trader covers the existing position and sells another position. The new position resembles the first — but the strike price of the option(s) and (sometimes) the expiration date change. Rolling is used to avoid closing the position and taking a loss. However, it is necessary to understand that some positions cannot be saved. Thus, be prepared to exit and accept a loss whenever you cannot find a suitable roll. Translation: If you cannot roll the position into one that you truly want as part of your portfolio, then do not roll. It is always a bad idea to create a new position that does not fit within your comfort zone. Rolling is a good technique when the trader understands how to manage risk. Too often position size increases after the roll. In general, creating a larger position is a bad choice because the money at risk also increases. Here are a few articles that I recently published at about.com. Each discusses one aspect of rolling a position. I’m very pleased to announce that I just published my new eBook, Iron Condors. Also available at iTunes, Barnes & Noble or your favorite bookseller. This is not your ordinary “How to trade an option strategy” book. Read the full description below. To celebrate the launch, I’m offering a special promotion to anyone on my e-mail list. If you are not already on the list, subscribe now and become eligible for the promotion. Buy either version of Iron Condors by Mark D Wolfinger and I’ll give you an eBook of your choice from the list below. Offer expired 8/31/2014. Thank you to everyone who participated. Buy the eBook. No matter where you buy it, you will receive a receipt. In the message, tell me which of the four eBooks (below) you prefer — and also the format: Kindle (.mobi) or ePub. Iron Condors is the third book in the “Best Option Strategies” series and each offers a hands-on education for some of the most useful option strategies. It is intended to be very different from all other books about iron condors. Expect to learn the basic concepts of trading iron condors: (1) How to decide which options are suitable for your iron condor. Know in advance that there is seldom a single ‘best’ position that suits all traders; (2) Ideas — with specific examples — on how to manage risk; (3) Figuring out when to exit. We’ll discuss the pros and cons of locking in profits quickly (not a good idea) vs. holding longer (but not too long). There is more that makes this book so special. It is not just a “how to” book because I share lessons learned from a lifetime of trading options (starting in 1977 when I became a CBOE market maker). I share my philosophy on iron condor trading and ideas on how a winning trader thinks. The goal is to offer guidance that allows you to develop good trade habits and an intelligent way of thinking about trading. We all learn as we gain experience, but some experience can be destructive when mindsets — that are dangerous to your longevity as a trader — become ingrained habits. This book helps traders avoid developing a difficult-to-break way of thinking. This book was prepared for an audience that already understands the most basic concepts about options. Although some of the material is suitable for rookies. If you do not understand the difference between a put and call or have zero trading experience, I encourage you to begin with the most basic concepts about options before continuing. There are numerous sources of information, but I recommend my recently updated (2013) The Rookie’s Guide to Options, 2nd edition. Another decision involves the pre-planned (I encourage preparation of a trade plan for each trade) exit when the target profit is achieved. If you have no profit target, then you will be hard pressed to exit when the trade continues to earn money. As profits accumulate, it becomes a daily decision: hold or exit. It is important to recognize when there is too little remaining profit potential for the prudent trader to hold. The trade plan helps with making good and timely decisions — and that makes you a more disciplined trader. Closing the position could also be a gut-wrenching decision that locks in a loss and is made because it has become essential to take risk-reducing action. 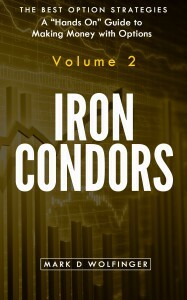 The book offers a solid introduction to risk management for iron condor traders. The following points represent the foundation of my beliefs, and the book is written accordingly: (1)The ability to manage risk is the most important skill for any trader; (2) Take time to learn about the Greeks. It is not difficult, and it allows you to recognize the risk (and reward) potential for any position; (3) Discipline is necessary when managing risk. It is one thing to say that you understand what risk management is all about, but it is another to put it into practice; (4) Let another trader earn the last nickel or dime on the call and put spreads that comprise the iron condor. Pay a small sum to exit, lock in profits, and eliminate all risk. The iron condor is most often traded as a single transaction, consisting of four legs. However, it is managed as if it were two positions. This is not a contradiction. This mindset is covered in detail. I posted a list of my recommended ideas when it comes to trading. You can find them here. These are ideas that I’ve developed over a lifetime as a trader (1975 thru today). A bunch of eBooks about trading options were recently published. Some are good, some not so much. It is difficult to separate the high-quality books from those serve little purpose. My classic book for beginners from the year 2000: The Short Book on Options (2002) became available as an iBook for the first time today, and I’m proud to join the Apple community. This book is not for the experienced trader. It is a detailed description of one strategy (writing covered calls) as well as a thorough description of how options work. The book is also available at your favorite book seller. The Greeks are easy-to-understand (honest) tools for measuring risk. You, the trader can delve into the math or you can accept the numbers generated by your broker’s (or use another source) software. The basis of risk management is using the numbers to control the possible gains and losses from your options trading. Using Greeks to Make a Trade. Selling Put Spreads. The Second Order Greeks: How Gamma Affects Delta.